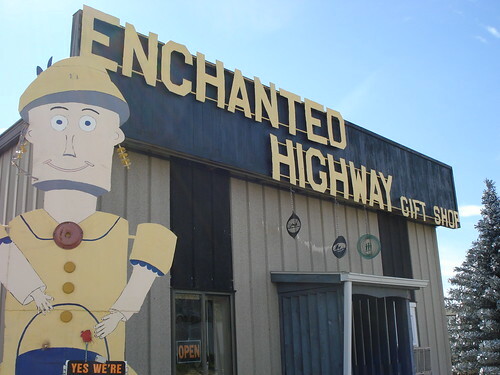 "Enchanted Highway" is a 32 miles (51.5 km) long stretch of road from the town of Regent, North Dakota till US Interstate Highway 94. 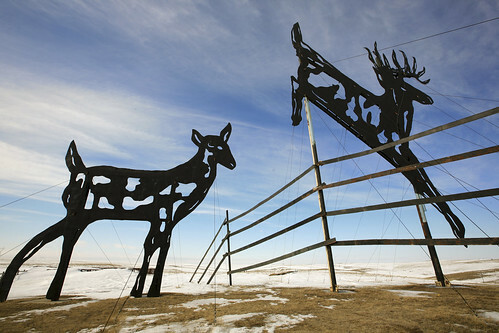 The road derives its name from the unique collection of the seven large scrap metal sculptures which dot its entire length. 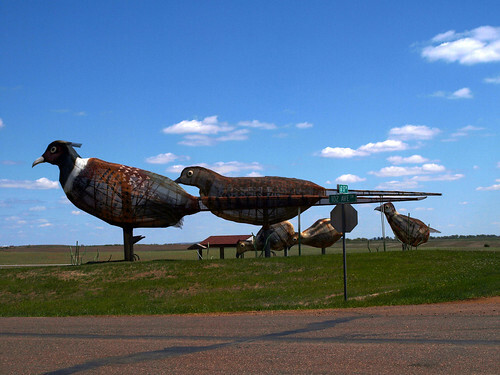 Local artist Gary Greff had conceived and built these sculptures to attract tourists to his home town which was slowly becoming a ghost town. 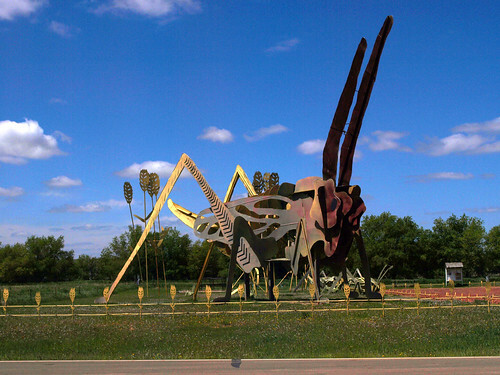 He learned welding and built all the sculptures from scrapped oil pipes, fuel oil and oil well tanks etc. He also taught welding to local farmers and involved local school kids also in his endeavour to make the town Metal Art Capital of the World. 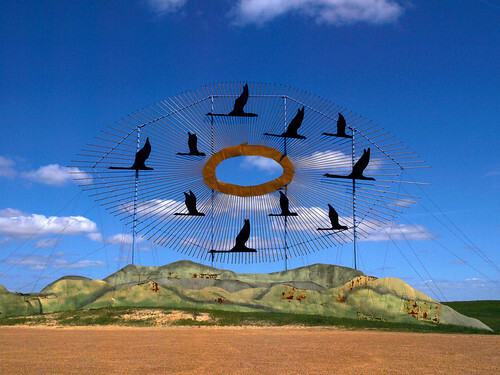 The 110-feet (33.5 metres) tall, 154-feet (47 metres) long "Geese in Flight" is listed in "Guinness Book of World records" as the world's largest metal sculpture. The largest goose is 19-feet (5.8 metres) long and has a 30-foot (9.1 metres) wing span. It may be noted that the "Angel of North" covered by me earlier is the widest metal sculpture in the World with a span of 54 metres (177 ft) across, while the "Geese in Flight" is the tallest and it also has a larger surface area. There are one large, two medium sized and three small size grasshoppers. The largest is 60-feet (18.3) long and 40-feet (12.2) tall and the medium sized are 12 x 15 feet (3.7 x 4.6 metres). 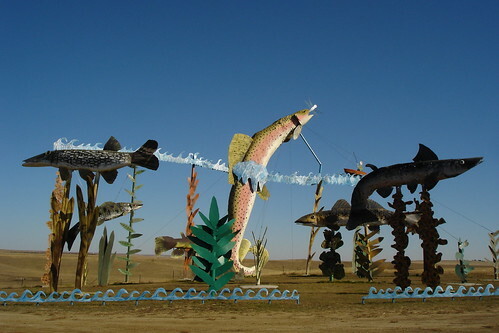 The art work depicts a lake with an assortment of 30-feet (9.1 metres) long game fishes: a northern walleye, a small mouth bass, a bullhead, a bluegill, a salmon and a 70 feet (21.3 metres) long rainbow trout. Built from pipe and gravel screening steel mesh, the rooster is 70-feet (21.34 metres) long and 40-feet (12.2 metres) tall; hen pheasant is 60-feet (18.3 metres) long and 35-feet (10.67 metres) tall and each chick is 20-feet (6.1 metres) long and 15-feet (4.6 metres) tall. 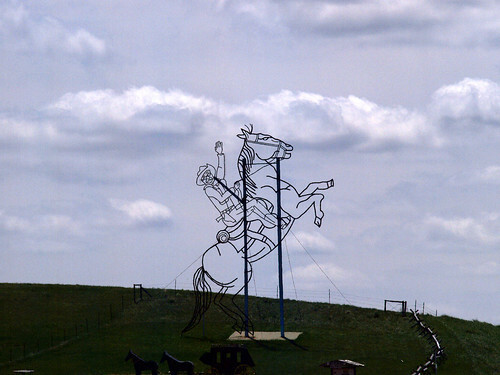 The 51-feet (15.5 metres) tall statue is a tribute to President Theodore Roosevelt's part in the history of North Dakota. 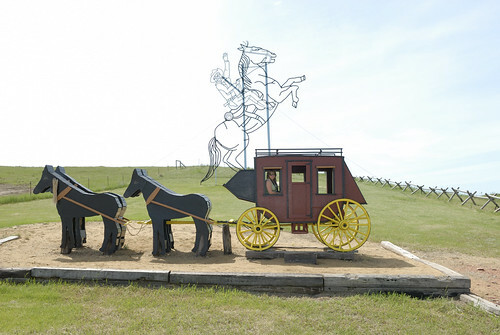 A stage coach was also added at the site as a picnic spot for kids. 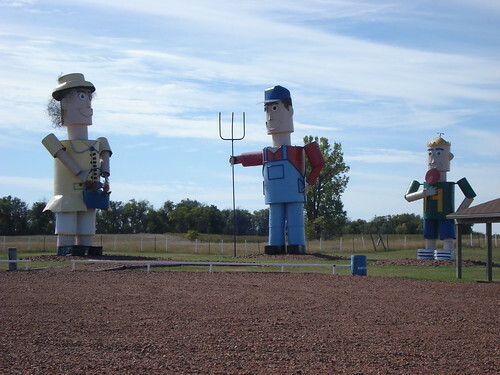 Tin family was the first sculpture to be installed on the Enchanted Highway and is nearest to the town. The man is 45-feet (13.7 metres) tall; woman 43-feet (13.1 metres) tall; and the boy is 23-feet (7 metres) tall. Credits: I am thankful to kite_surfer, Member and Master Cartographer, Google Earth Community who took the trouble of finding the location of each sculpture and marking the same in Google Earth. Thank you Kite!